Your decision on whether you’ll be Taking Your Bike Overseas could have a big effect on your cycling trip, not to mention your trip budget. Make the wrong decision and you could be either cursing your bike, or cursing the fact you didn’t bring it! Have you tried to find an authoritative source of information on Taking Your Bike Overseas? There isn’t one. Until now. Every person has a a different take on Taking Your Bike Overseas and the problem is that most articles are written according to the writer’s biases. Trust me when I tell you that having your own bike when you’re overseas is really awesome. You can head out for a ride whenever you please, and don’t have to worry about hire shops. However, it’s not all beer and skittles. Lugging a bike around on your holiday – unless you’re prepared for it – can be a total pain. Dragging a bike around the airport, getting taxis, hiring bigger cars, storing your bike bag, trains – you need to consider everything through the prism of what the focus of your trip is. I’ve been through the travails of taking a bike overseas for a cycling holiday (several times). I know the ins and outs, and I want you to know, too. The VeloNomad Guide to Taking Your Bike Overseas discusses the ins and outs of taking your bike overseas versus hiring a bike, and a whole lot more! 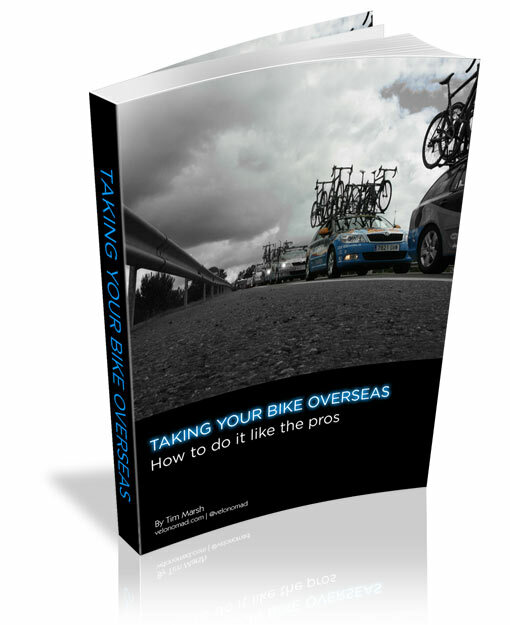 You can get the Guide to Taking Your Bike Overseas now as an instant download. REFUND POLICY: I’m so confident you will be completely satisfied with your purchase, that you’ll receive your money back, guaranteed, no questions asked, if you’re not happy with the Taking Your Bike Overseas guide. Here’s what you get in the guide to Taking Your Bike Overseas.